John Milton's Paradise Lost celebrates the 400th anniversary of the birth of John Milton (1608–1674) with an exhibition drawn from the Morgan's collection of the English poet's work, which includes the only surviving manuscript of Paradise Lost. 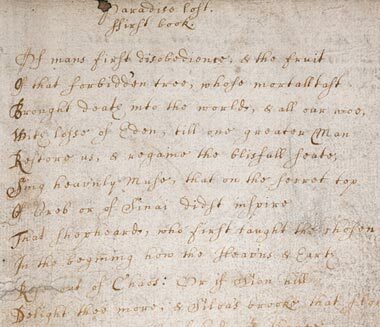 This manuscript of the first book of Milton's epic, transcribed and corrected under the direction of the poet, who had become blind, was used to set the type for the first printing of the poem in 1667. Copies of the first and later editions of the poem, including the first edition of Milton's work printed in the United States, are also on view. The exhibition also features Albrecht Dürer's engraving The Fall of Man, William Blake's Milton: Old Age, Richard Westall's watercolor depiction of Satan, and a rarely seen miniature portrait of Milton. This exhibition is made possible through the generosity of Mr. and Mrs. Rudy L. Ruggles, Jr.
of Book I (detail), in the hand of an amanuensis, ca. 1665. Purchased by Pierpont Morgan, 1904; MA 307.